It was almost like the course offering of my university's European Languages department. The passengers of our boat were predominantly European: a Polish couple, a Brit backpacker, a few Russians, and a bunch of boisterous French guys. Me and my companions, Arvy and Rach, plus a few Koreans and several Malaysians, rounded out the international bunch. The destination: Ariel's Point. 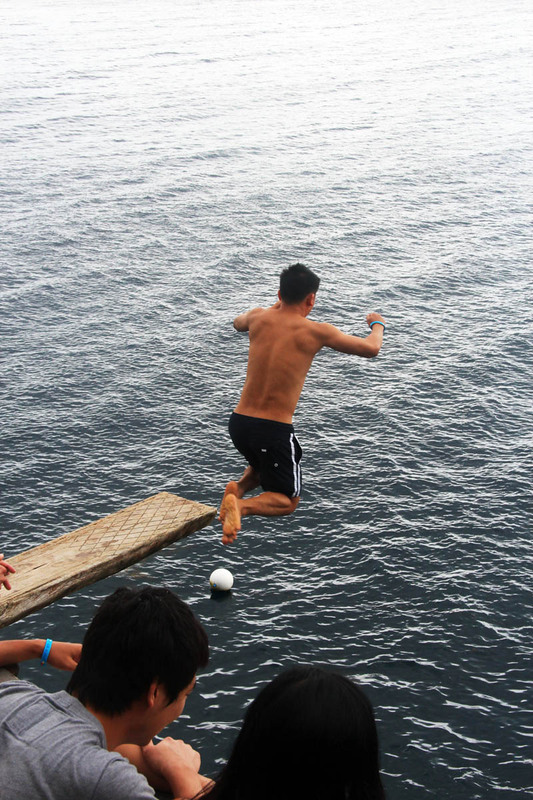 The objective: cliff diving. Ariel's Point is actually a part of Buruanga, a small fishing town in the province of Aklan. 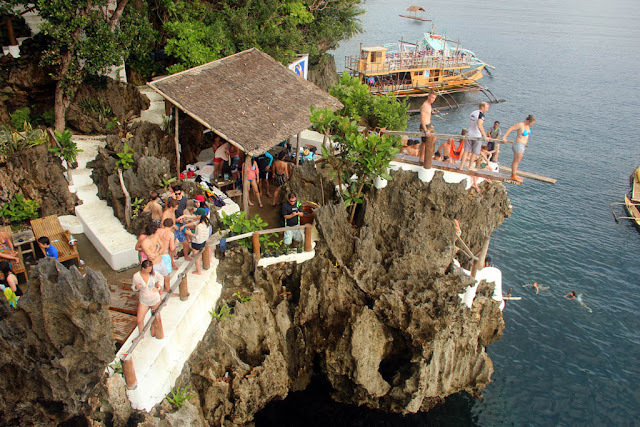 It is about 30 minutes by boat from Boracay, and it is our first destination on the four-day trip to paradise. 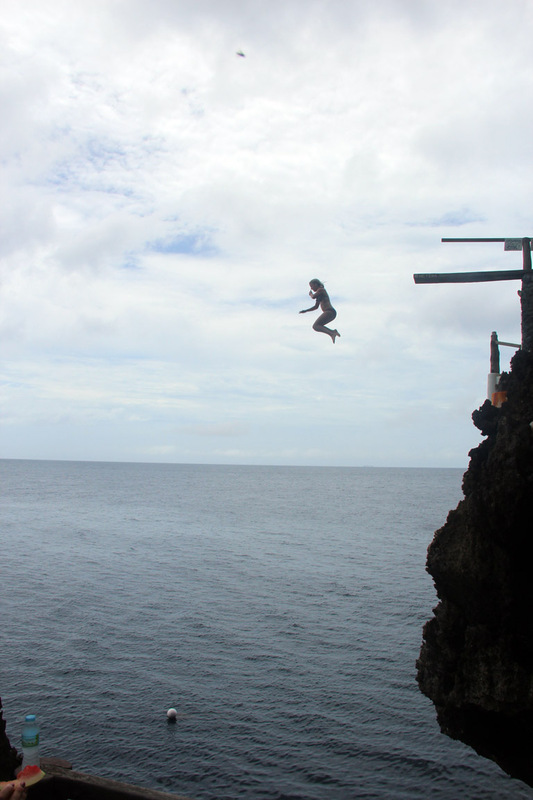 Facing the Sulu Sea, Ariel's Point has many karst outcropping that made it ideal for cliff diving. 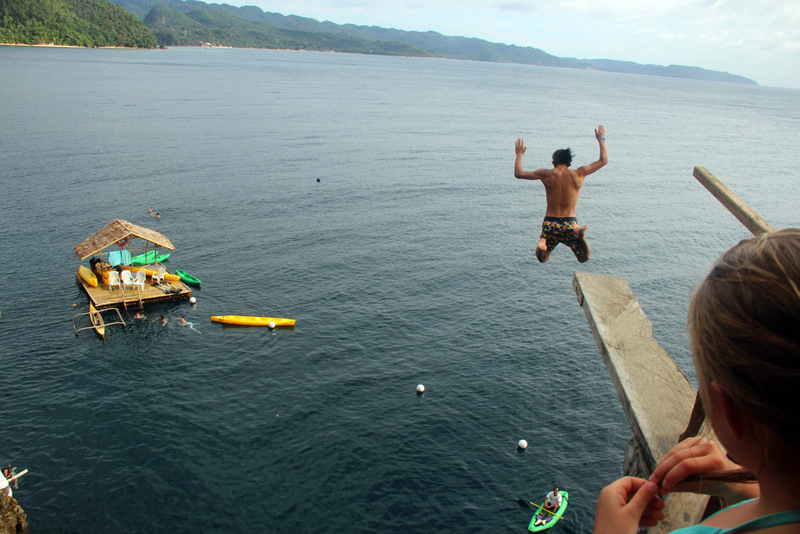 Five cliff diving sites at various heights were built on a clearing at the top of the karst cliff. The highest jump off point - which has a wooden plank jutting out to the sea - is 15 meters high, the next 8 meters, then 5, and the lowest at 3 meters from the sea level. Stairs were built at the sides of the cliff, going from the base through a cave-like formation to the top, where the huts and the cliff diving boards were located. 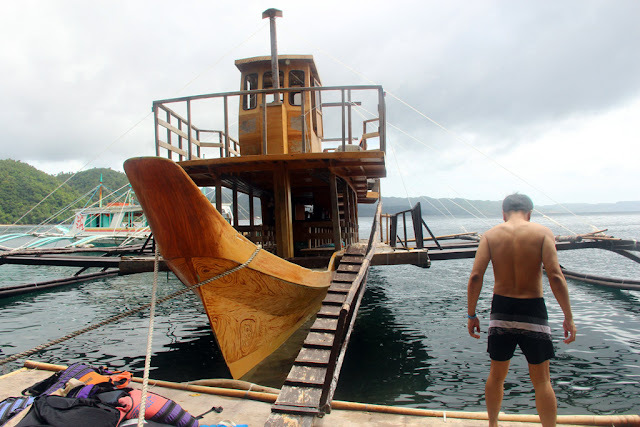 From the sea, one can only go up through the stairs, which is connected to a small bamboo jetty where the motorized bancas dock. 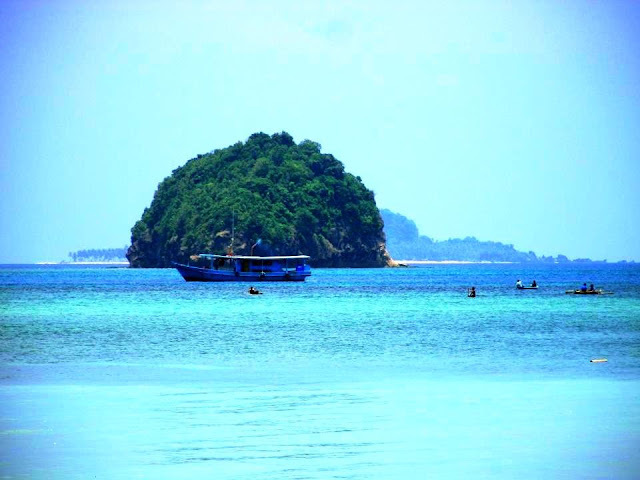 Two motorized boats-ful of adventurers, including us, set out to Ariel's Point that day. When we got there the staff started handing out drinks for every one, with no limits. Some started imbibing beers and rum Cokes, maybe to get the edge off. More adventurous ones started diving (more like cliff jumping, as we were told that diving head first is not allowed). As I planned to jump too, I started collecting myself and mustering the courage to do so, getting encouragement from Arvy and Rach. After trying things like going up a skyscraper and ultralight flying, I can say for myself that I don't have a fear of heights. Nonetheless I still felt a bit of vertigo when I walked to the end of the plank and stared down below to the sea. If my brain can speak and shout, it would have been yelling, "are you crazy?" But I did it anyway. I took a step back and lunged with my foot. It was over in less than a second, but I think there was a moment there when things felt as if it was on slow-mo, then the water hits you and everything's on normal mode again. I swam back to the edge of the cliff amid the claps of the spectators above and climbed up to the hut to ask for a stiff drink to calm my nerves. 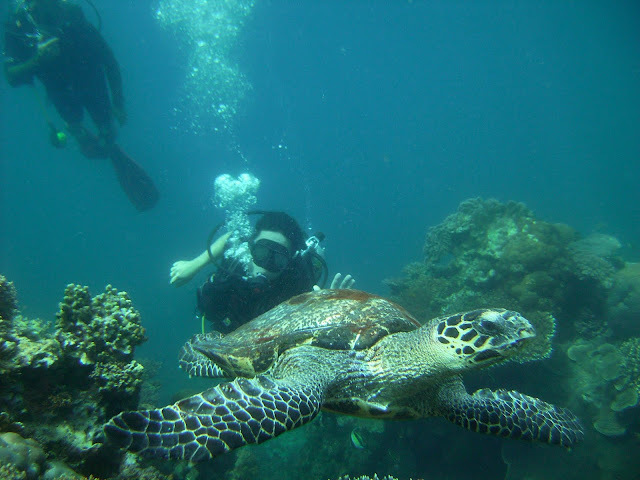 I took another dive, in the same height, just so I can have my picture taken. I then pestered Rach to do the same, finally able to cajole her to try the three-meter platform. Soon, lunch was served, and we were allowed to use the kayaks and the snorkeling gear after everyone had their fill. We tried kayaking around the cliffs while watching other people jump off the cliff, occasionally shouting an encouragement or two to the hesitant ones. We set out at around 5 pm. The waves were larger on the trip back, so we were given plastic bags to wrap our belongings in to protect them from the spray. We were soaking wet in no time, as large waves lashed at our boats one after the other. The spirits of those inside were not dampened though, as everyone were having a good time singing and chatting, helped by the unlimited liquor served on board. We got back in White Beach just before sunset. 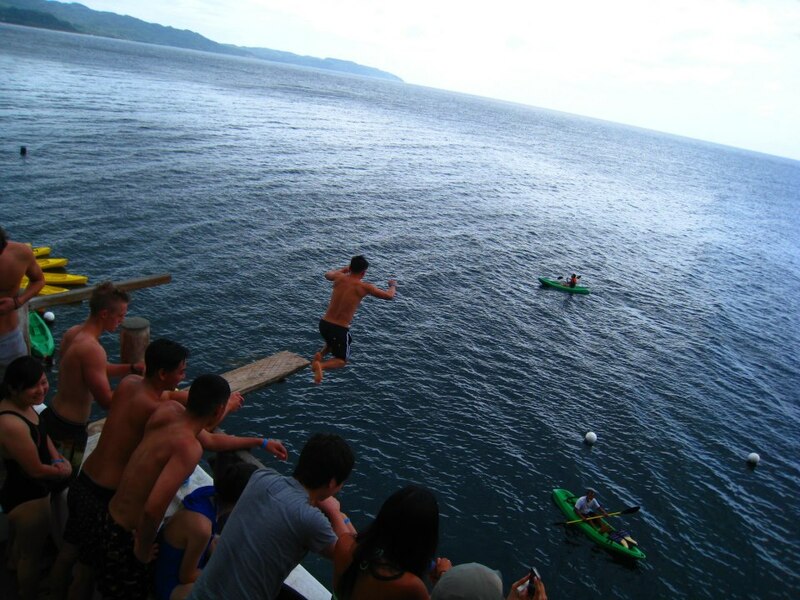 Ariel's Point is located in Buruanga, Aklan, about 30 minutes away by banca ride from Boracay's Station 1. 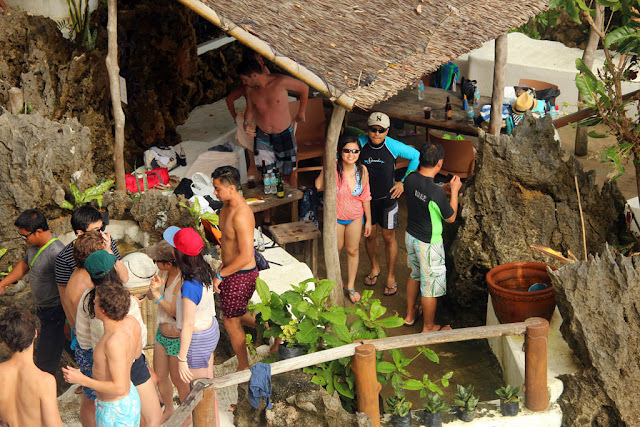 Tickets, which are on first-come-first-served bases, are purchased at Ariel's House, which is located along White Beach, or booked online through sites such as My Boracay Guide. Boats leave for Ariel's Point every 11:30am, and go back by 5pm. 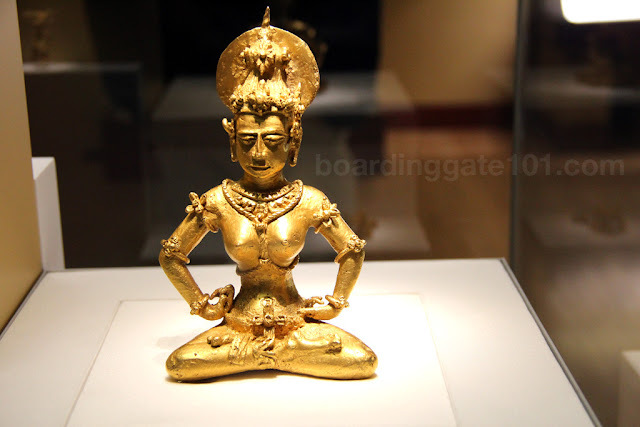 The day tour package costs PhP1,500. It includes lunch, afternoon snacks, and unlimited drinks (sodas, bottled water, beer and rum Cokes, both in Ariel's Point and in the boat. The fee also includes use of snorkeling gear and kayak. Be sure to bring a swimsuit, and a weatherproof camera. a therapy for people with fear of heights! 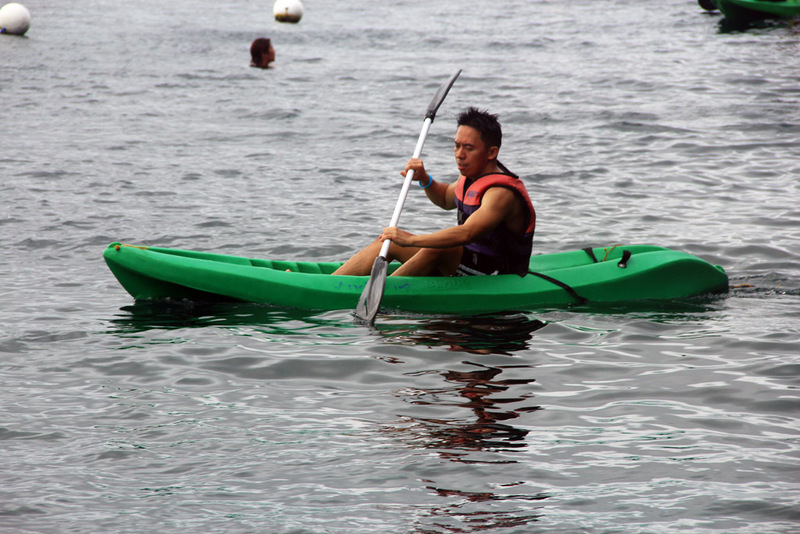 Thanks for sharing your great experience as well as your cool photos.When you have time to visit Philippines, you'll experienced how Kayak Philippines is very popular.